A New Reality—Monster Storms. Flooding. Wildfires. It's time to take fortified homes and resilient cities seriously. "Resilience means more than just picking yourself and your neighbor up off of the mat. It means adapting and changing in light of new realities." Green Builder Media announces the digital release of their January-February 2018 issue which covers Resilient Building. Faced with high probability of more Category IV and V storms, builders have voluntary and code-mandated ways to integrate the lessons of Katrina, Harvey, Charley, Sandy, Irma and Maria. The issue also includes coverage of the VISION House Flex House. The Flex House's net-zero-energy readiness includes an efficient and airtight envelope, lowered demand and a responsive renewable power system. 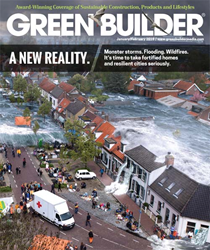 Green Builder® Media, LLC is the nation’s leading media company focused on green building and sustainable living, affecting positive change by providing inspirational information to over 200,000 progressive building professionals and 38 million consumers who are interested in sustainable living. With a comprehensive suite of content marketing, digital, social, and print media options, high-profile demonstration projects, market research, and live events, Green Builder Media offers a blend of visionary and practical information covering a broad spectrum of sustainable living topics, including Internet of Things, smart home technologies, energy efficiency, water conservation, indoor air quality, resilient housing, renewables and clean transportation. For more information, visit https://www.greenbuildermedia.com.